A China-funded railway will replace the 100-year “Lunatic Express,” but it may come at the expense of iconic wildlife. NAIROBI, Kenya — Last month, Kenya was the toast of the wildlife conservation world when it hosted a spectacular “ivory burn,” setting fire to $172 million of illegal wildlife goods to protest elephant poaching. But the very same park that hosted the ivory burn may soon be slashed by a railway. The China-funded Standard Gauge Railway threatens to cut through a large swath of Nairobi National Park, a move that could be disastrous for the park’s environment and wildlife. A controversial proposal to route one section of the railway through the park is currently in limbo. The Kenya Railways Corporation on Wednesday proposed three potential routes, including one that would include 6 kilometers of rail inside the park, but an alliance of conservation groups is heavily lobbying for a reroute. For Kenya, the railroad is emblematic of the clash rapidly modernizing countries face between economic development and environmental preservation. The economic powerhouse of East Africa definitely needs to replace an ancient railroad nicknamed the “Lunatic Express.” But at what cost? 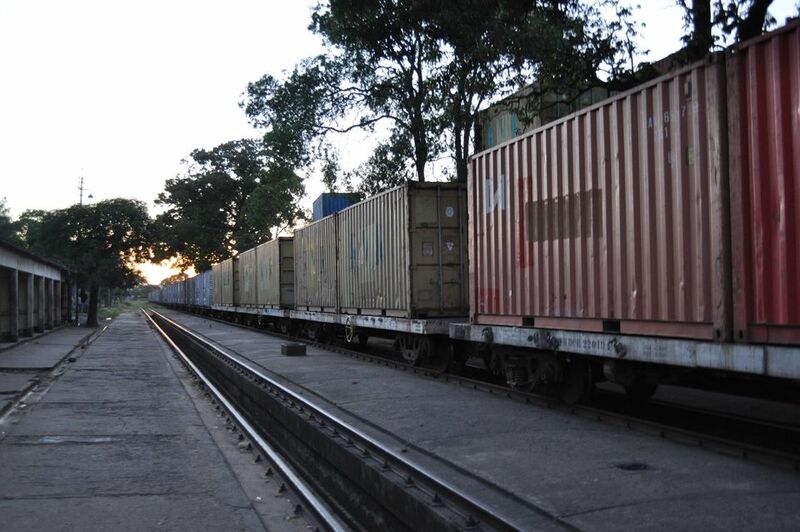 A “Lunatic Express” cargo train along the old route at Mombasa Station. The ambitious new Standard Gauge Railway will span Kenya, from the Indian Ocean port of Mombasa, to the capital of Nairobi, and onward to Uganda, Rwanda and South Sudan. The $3.8 billion project is funded by China and is being built by the China Roads & Bridges Corporation. It will replace the current Kenya-Uganda route, a colonial relic dubbed the “Lunatic Express“ that Indian laborers built under British supervision at the turn of the 20th century. (Its construction resulted in almost 2,500 deaths — including a few lives lost to infamous Kenyan man-eating lions.) A creaking train still makes the Mombasa-Nairobi trip three times a week, but it takes up to 14 hours longer than the equivalent bus route. So it’s hard to deny that Kenya needed a new railway, especially considering the volume of cargo traffic in East Africa. But did it have to be a brand new railway? A World Bank report from 2013 concluded otherwise. It suggested four ways of upgrading the railway: three variations on revamping the current track, and a fourth, more expensive option to build a new one. Kenya decided to build a new one. When the World Bank balked at the expensive choice, China stepped in as financier and builder. And its proposal ended up costing more than twice as much as the World Bank’s high estimate. Phase I of the railway, from Mombasa to Nairobi, is under construction and slated to open in July 2017. But it’s the still-unbuilt Phase II, from Nairobi to the Ugandan border town of Malaba, that has attracted controversy for its potential route through Nairobi National Park. NNP is the world’s only national park in a capital city, and is home to dozens of iconic species, including giraffes and lions, just miles from the city center. The plan to route the railway through a slice of the park leaked in December 2015, causing a large social media outcry. The Railways Corporation backtracked on that specific route, but it has not ruled out a path through the park altogether. A spokeswoman for Railways told The Huffington Post that plans have not been finalized for the route of Phase II. The three options on the table, according to a report in Business Daily Africa, are an overland bridge, a tunnel or a track that avoids park land but would cost an extra $280 million. One source of confusion has been the splintered dialogue between the government agencies that would be affected by the railroad. The Railways Corporation did not openly communicate with the wildlife service, for example. Paul Gathitu, deputy director of Kenya Wildlife Service, said the body had not been invited to any early meetings about the prospective route. “If anyone approved the route through the park, it was not us,” he told HuffPost. The three proposals that were recently presented to KWS for review are thus both a conciliatory gesture and an attempt to force the conservationists’ hand. A coalition of nonprofits is working with KWS to convince the Railway Corporation not to lay down tracks in the park. These include Friends of Nairobi National Park, the Conservation Alliance of Kenya, the East African Wild Life Society, WildlifeDirect and the Kenya Alliance of Resident Associations. The activists say any construction would seriously harm the park wildlife. They point to the fact that Phase I of the railway has already disoriented elephantsin Tsavo National Park near Mombasa, where it interferes with elephant migration routes. The wildlife service is belatedly fitting elephants with radio tracking collars, but that hasn’t fully mitigated the effects of construction. There has been an escalation in “human-animal conflict,“ whereby elephants that are confused by mounds of earth along the construction site run amok, destroy crops and threaten residents’ lives, according to a local wildlife officer. Kenya Wildlife Service and Save The Elephants staff attempt to collar an elephant in Tsavo National Park, near the Standard Gauge Railway, to fit it with a satellite radio tracking collar. Nairobi National Park is less than 1 percent the size of Tsavo, so it’s even more fragile. “Unlike in Tsavo, where some animals’ migratory corridor is affected, we actually stand to lose core habitat in Nairobi National Park,” Vishwanath said. Gathitu, of the wildlife service, maintains that any construction will have fallout for the park’s animals. “I can guarantee that anyone who deals with conservation would prefer no disturbance,” he told HuffPost. Vishwanath said conservationists have become smarter about dealing with threats to the park after their recent experience with the Southern Bypass Highway. In November 2015, the wildlife service agreed to let the highway authority use 53 acres of park land (about 1 percent of the park) for a new road called the Southern Bypass. Vishwanath said that compromise came after two years of negotiations, during which the acreage at stake fluctuated from 43 to as many as 150. Vishwanath said the conservationists won their case on a technicality: The highway license was granted on the condition that it wouldn’t go through the park, but the road was redesigned immediately after the license was obtained. When conservationists took the case to court in May 2013, they won the right to suspend work on the disputed section. WildlifeDirect and the Conservation Alliance of Kenya has enlisted engineers to proactively draw up alternatives to the proposed route to present to the Railways Corporation. The civil engineer Eric Goss, for instance, proposed one route that would entirely sidestep the park. “This route is about 14 km longer, but it might not necessarily be more expensive, as the land costs much less outside the city,” Goss told HuffPost in an email. After the Railways Corporation’s three proposals were announced this week, FoNNaP is scrambling to “act quickly” and propose alternatives to the Railways Corporation, a FoNNaP spokesman told HuffPost. They contest the notion that the only way to avoid park land would be to spend an extra $280 million. Goss’ proposal for routing the SGR around Nairobi. “It’s basically going back to Athi River, then behind Nairobi National Park, and down into the rift just south of Ngong Hills.” The pink is the original route — which is now shelved — and the orange is Goss’s proposed route. Maintaining the old railway is costly in itself, and since Kenya must pay back China’s investment with interest, delaying it will increase the tab even more. FoNNaP hopes to avoid another legal battle. Richard Leakey, chairman of the wildlife services’ board and a celebrated conservationist, is more ready to compromise than the conservation groups. He even approved of the earlier route, now rejected, that went through the park, telling the Guardian that some disruption would be inevitable for Kenyan citizens to get the infrastructure they need. The Railways Corporation, for its part, also has become more aware of environmental impact. A spokesperson says it has prohibited nighttime construction, which disturbs animals’ sleep habits. It also provides “environmental restoration grants” to wildlife services to fund measures like elephant tracking. Now that the Corporation has presented its options to the wildlife service, conservationists hope a more favorable compromise between conservation and development can be reached.